Every few months someone asks me about crib mattresses. With good reason. Babies spend a lot of time sleeping! I think greening the bed should be a pretty high priority for anyone trying to expose their family to fewer toxic chemicals. Last month Clean and Healthy New York published "The Mattress Matters," a report about crib mattresses that does a great job of summarizing the issues and concerns surrounding the materials used to make crib mattresses. The report includes a chart which describes the core materials, padding materials, cover materials, flame retardant treatment, waterproofing and antibacterial agents, potential allergens, as well as approximate price of over 50 crib mattresses. One key point made by the report is that many crib mattresses making "green" claims or using green materials (such as organic cotton) also contain chemicals of concern (such as antibacterial or waterproofing chemicals). If you are in the market for a crib mattress, I would recommend reading the entire report (it's less than 20 pages and pretty quick reading). Those are all things I would avoid if shopping for a crib mattress. My favorite part of the report is the section "What’s in a Mattress? The Pros and Cons of Material Choices" (begins on p. 10 of the PDF of the full report). I was especially interested in the section on flame retardants. The report describes wool and hydrated silica as the safest, least-toxic flame retardant materials; boric acid and fiberglass are described as low hazard flame retardants. The report also tells you the stinky companies that refused to disclose flame retardant, waterproofing, or antibacterial materials. Beware of unsubstantiated green claims. Third-party certifications by Greenguard, Oeko-Tex, and GOTS are meaningful. Terms like "pure," "natural," and "eco" are unregulated and may or may not meaningless. 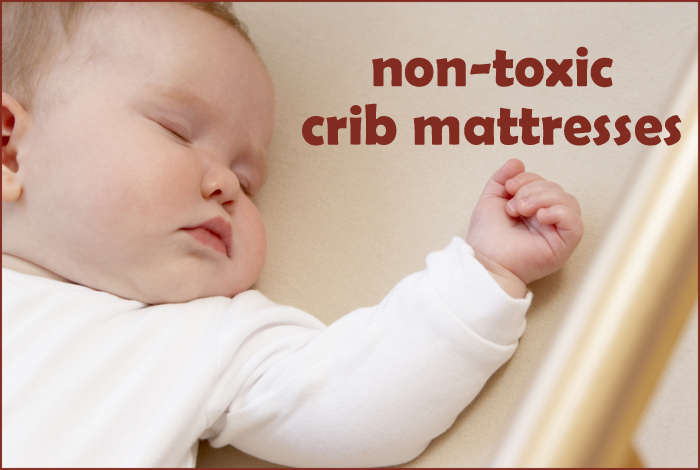 Look for a crib mattress for which all materials and chemical treatments (including flame retardants, waterproofing agents, and antibacterials) are disclosed. Look for a crib mattress made of all-natural materials: latex, cotton, wool (metal coils also fine). Coir (from coconut) and horse hair are natural materials that are also used in mattresses. No vinyl, no polyurethane foam and preferably no plastic (there is some consensus that polyethylene is safe to use). My preference is no flame retardant treatment at all, either because of sufficient wool content or because you have a doctor's note exempting you from meeting the federal flame retardant standard (read more about my reasoning for this under the heading "A Note About Flame Retardants in Mattresses" in this post). If the mattress has a flame retardant treatment, I would prefer boric acid or hydrated silica. The report does bring up the fact that wool and natural latex are potential but rare allergens. I've never worried about these materials, as allergies don't really run in my family. The mattresses our family sleeps on are made of organic cotton and natural latex and we use wool puddle pads. Personally, I would rather my family sleep on wool and natural latex than hydrated silica, boric acid or polyethylene. One more mattress that is not covered in the report and that recently came on the market is the Lullaby Earth Super Lightweight Mattress (made primarily of food-grade polyethylene foam) by the Naturepedic folks. The mattress is Greenguard certified and costs $159. A couple of my friends have this mattress and have been happy with it for the price. If $200+ for a crib mattress is out of the question, I think that's your best bet. My Green Mattress makes a crib mattress out of organic cotton, natural wool, and coils in the USA for $249 including shipping. The Futon Shop makes an organic cotton crib mattress (currently on sale for $216) and an organic cotton/natural latex crib mattress (currently on sale for $280). Both come with an organic cotton/ polyurethane waterproof cover. You need a doctor's note (and an additional $50) to avoid the boric acid flame retardant treatment. They will ship a crib mattress within the U.S. for $65. Both of our mattresses are from this store, which is local to me. Matsu makes an organic cotton crib-size futon ($160) and an organic cotton/ wool crib-size futon ($200). You need a doctor's note to avoid the boric acid flame retardant treatment. They also ship. My sister-in-law purchased twin futons from this store and said they were thinner than expected and only worked because her kids' beds had a wood plank beneath the mattress. KelleyGreen makes an Eco wool crib mattress ($444) and an Eco wool crib mattress topper ($185). I have no personal experience with this mattress, but I have purchased and been very happy with several wool products from this store. For more information on beds and bedding (including mattress protectors), see my post In Search of the Affordable Natural Bed. If you know of another non-toxic crib mattress (especially an affordable one! ), please share in the comments! What do you look for in a crib mattress? Thank you for all of the helpful information. It's hard to sort through all of the "green" information. Wow! A lot to think about! Like you, we co-sleep, so i haven't actually thought much about crib mattresses, but I know the day is quickly coming when we'll need to move Garrett to his own bed. Thanks for the info! This is such fantastic info! As I look for some new things for baby-on-the-way, I'm reminded every day about how green claims do not equal a perfectly green product. Pinning this. Thank you so much, this article is just what I needed, I am in pursuit of a non-toxic crib mattress! Excellent article.. Thank you so much. I am looking for a non-toxic natural crib mattress too, but all of the best options are so expensive and beyond reach. :(.. I came across the Willow Natural Coconut Palm Crib Mattress by DaVinci - $165 (http://www.amazon.com/Willow-Natural-Coconut-Palm-Mattress/dp/B001N44BXE). Claims there are no added flame retardants and coconut fiber/latex-free foam. Have you heard of this one before ? Thank you for sharing! Very helpful information! Here is an Etsy shop I found out: https://www.etsy.com/shop/TheHomeOfWool. Very affordable and trustworthy.